For businesses trying to cultivate a strong local presence online, building a collection of quality citations is crucial. Authoritative citations can improve a business’ visibility and help it rise above competitors in search results. That said, there are plenty of issues caused by getting as many online mentions as possible without worrying about citation quality. In fact, inaccurate or low-quality citations can cause lasting damage to the business’ local presence. So what’s the secret to success? It’s building a range of high-quality citations from authoritative sources. Let’s take a closer look at why citation quality is much more important than citation quantity in the world of local search. Quite a few problems can arise when businesses focus on getting more – not better – local citations. Building a ton of citations does spread awareness about the business online, but if the citations are low-quality or inaccurate, they do more harm than good. Bad data is contagious and can spread to other sources. The more inaccurate citations a business has, the harder it will be to correct all the data and clean up the mess. Search engines don’t trust businesses that rely on citations from unscrupulous sources, which means the business will likely rank lower in search results. The more mentions of the business online, the more effort is required to monitor the citations. Of course, it’s fine to have lots of good citations, especially if the business has the resources to monitor for accuracy. Weak citations create a very real potential for long-term damage to a local business’ online visibility. So, what’s the solution to bad data and low-quality citations? Local businesses need a balanced approach to building citations that focuses on quality and value over volume. 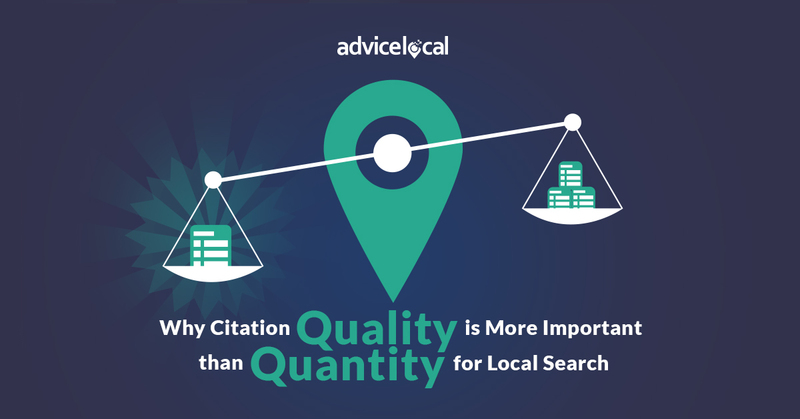 In fact, the quality of a business’ local citations is one of the most important factors in local search. Fortunately, good data can spread among sources the same way bad data spreads. However, when accurate, current business data propagates across the web, a positive feedback link is generated, strengthening the local presence. Maintaining consistent NAP data (business name, address and phone number) online allows businesses to earn the trust of search engines. Having a few high-quality citations on authoritative websites can boost the business’ visibility in local search results, driving more traffic to the business’ website. Consumers expect businesses to display up-to-date NAP data, location hours and driving directions online. Having a consistent, uniform online presence builds trust among potential customers and draws more people to visit physical store locations. When it comes to building a stellar local presence online, no business can afford to overlook the importance of local citations. Left unchecked, low-quality citations can wreak havoc on a business’ local presence. So, is the business you represent being impacted by bad data or inaccurate citations? The Advice Local team is here to help! Get in touch today to find out how we can clean up your local presence, boost your visibility and help you attract more customers. Is the Google My Business Listing Replacing the Local Business Website?